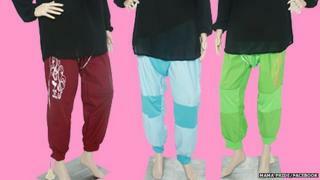 A company in Malaysia has created full-length trousers for women to wear when they are in labour. The trousers are aimed at Muslim women who are concerned about exposing parts of the body which are meant to be kept covered according to some interpretations of Islam, known as "aurat", the Malay Mail website reports. They look similar to tracksuit bottoms, but have "an opening to let the baby out" while still covering a woman's legs, according to manufacturers Mama Pride. "While giving birth, the honour and aurat of women are not given any attention," the company says on its Facebook page. "Thighs, calves and knees are exposed, even though they don't need to be." A number of medical professionals are pictured on the page apparently endorsing the product. The issue of modesty in women's attire has been the focus of much debate in Malaysia recently. There have been several cases of women allegedly being refused entry or asked to cover up in public buildings because their skirts were deemed too short. Earlier this month, gold medal-winning gymnast Farah Ann Hadi faced abuse online and from some Islamic groups for wearing a "revealing" leotard while competing at the Singapore Sea Games. Ms Hadi has since received support from the sultan of Selangor state, who said people should be celebrating her achievements, not criticising her clothes.